When it comes to collecting MMA and UFC, Georges St-Pierre cards are among the hottest. The long-time champ has been largely embraced by fans and is one of the most popular names in UFC's history. 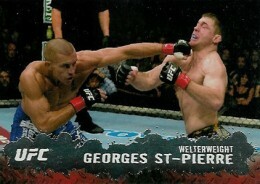 Shop for Georges St-Pierre cards on eBay. Collectors already have more than 400 Georges St-Pierre cards to chase, including a ton of autographed and memorabilia cards. Since 2009 Topps UFC Round 1, the Welterweight Champion has been a focal point of every Topps UFC product. GSP cards have also appeared in products from Donruss, Upper Deck, In the Game and Sportkings. 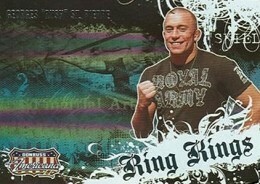 Here is a list of ten Georges St-Pierre cards worth considering for any UFC card collector. They may not be the most valuable GSP cards on the market, but all represent a rounded collection. We also limited our list to cards that are somewhat available. None with print runs less than 50 appear because, individually, they show up on the secondary market very infrequently. 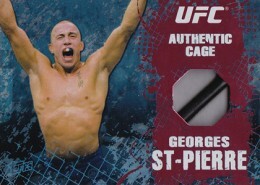 2008 Donruss Americana II has the first pack-inserted Georges St-Pierre card. Part of the Ring Kings insert set, the foil card has a print run of 500. Even more popular are autographed and memorabilia versions. Oddly, though, despite lower numbering, the signed versions are more readily available on the secondary market than the basic versions. That doesn't mean there are fewer, however some dealers may not think the basic version carries enough value to list them. This is the closest collectors will find to a Georges St-Pierre rookie card. Part of the hugely popular (and pricey) 2009 Topps UFC Round 1 set, card 17 features both GSP and Karo Parisyan in their fight from UFC 46: Supernatural in 2004. It's not numbered and it uses a sticker, but the 2009 Topps UFC Round 1 Georges St-Pierre autograph will always be one of his most important cards. It's his first signature in a UFC-licensed trading card product. A Red Ink version is numbered to 25. Although not as desirable as the St-Pierre/Parisyan base card from Round 1, the 2009 Topps UFC (Topps' second UFC set) is the first regular UFC card to name just GSP. Bloodlines has become so popular as a UFC insert that it's blossomed into it's own standalone product. Debuting in 2009 Topps UFC, the cards feature a foil design with the fighter's national flag in the stylized background. For St-Pierre, that means the red maple leaf. 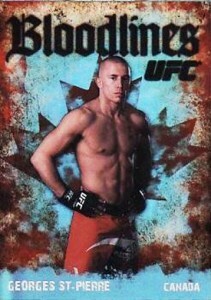 GSP is considered a national hero in his home country of Canada. Not only does the 2012 Topps UFC Knockout Georges St-Pierre Full Contact Autograph come on-card, but it's also done in silver ink on a black background. Further helping the card out is its status as being more available than a lot of his other autograph cards. It comes numbered to 99, which makes it tough, but not impossible to find. Few things are more iconic to the UFC than its caged Octagon. 2010 Topps UFC Main Event Cage relics come with a piece of the fence that surrounds the battleground. This may not be the most valuable Georges St-Pierre relic, but it is still an intriguing addition, offering a more unique spin than the much more common mat relic cards. Topps Finest UFC has quickly become one of the most popular MMA trading card brands. One of the key components is an increased number of on-card autographs. 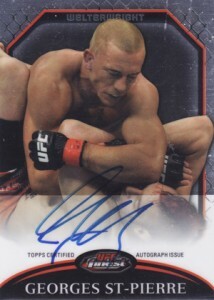 Besides the regular unnumbered version, the 2011 Topps Finest UFC Georges St-Pierre autograph has several parallel versions, all numbered to 25 or less. Available only at the UFC Fan Expo in Toronto in April, 2011, the Georges St-Pierre Commemorative Belt Autograph is one of the fighter's most attractive and distinct cards. Besides an on-card autograph, the highlight of the card is a replica title belt done in gold foil. Because it is an event-exclusive, the card can be tricky to find. However, because there are 199 copies, it's not as rare as other GSP autographs. The landscape of relic cards is crowded. Some are pricey, others are extremely cheap. 2102 Topps UFC Knockout Premium Pieces finds a middle ground. Numbered to 88, all come with more compelling swatches of fighter-worn gear, such as multi-colored pieces. An autographed parallel is also numbered to 88. Like the one where he’s kicking Karo Parisyan in the head. That’s his first UFC fight so has a lot of significance.